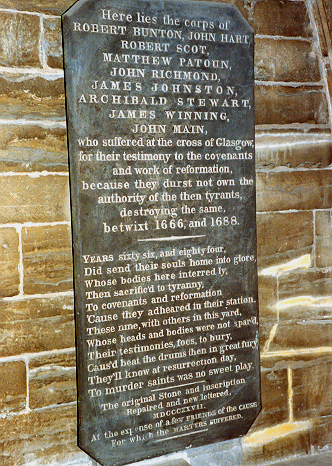 Four Covenanters were executed at Glasgow Cross on 19 December 1666, having been tried two days earlier. They had taken parrt in te Pentland Riing. 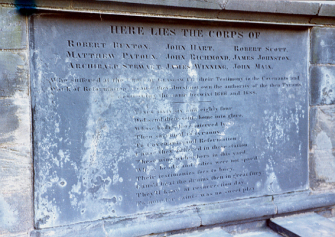 The other five Covenanters listed were tried in Glasgow on 1 March 1684 and executed on 19 March 1684. There are two monuments that commemorate the nine Glasgow martyrs at the Cathedral. One of hese is located on the wall outside of what is known as the Martyrs' Vault. The other is located inside the cathedral itself. Caus'd beat the drums in great fury. To murder saints was no sweet play. According to the records, John Main ‘belonged to the parish of Old Monkland’. He was captured about the same time as John Richmond, Younger of Knowe, which took place in the Gorbals area of Glasgow in November 1683. John Main was tried before a special commission at Glasgow on 17 March 1684. According to Rev Robert Wodrow, they were charged with having been at the Battle of Bothwell Bridge and also in conversing with those who were there. Although many witnesses were brought before the five Covenanters tried that day, no specific evidence could be brought against them. When asked about the death of Charles I and of the murder of Archbishop Sharp, they remained silent, which was seen by the authorities as an admission of guilt. The sentence of death was passed. The execution took place on 19 March 1684. The gibbet was set up at Glasgow Cross and one by one the five Covenanters were hanged. ‘The Last Testimony of John Main’ was recorded and was published in The Cloud of Witnesses. In it he records the fact that at the time he had a mother and two sisters still living.